In the wake of the Black & White implosion Fred and I retreated. We were a little burnt out from the wicked pace we had set producing Shadowlock #1 and to have it come to naught was frustrating. One of the most valuable lessons we learned though was that we were just not ready, and neither was the product. In the process of developing a back-story for Shadowlock, the universe in which he lived had expanded dramatically. I'm not sure exactly when it became clear, or which one of us suggested it, but we realized that the story we wanted to tell didn't start with Shadowlock. It actually began with his father, Greylock in a time time period that predated Shadowlock by 20 or 30 years. This was a giant leap for us, and gave us a freedom we hadn't had before. We realized our story wasn't simply about one man, but about where he came from, and his entire universe. A lot of the universe he lived in had been influenced by Greylock and the legacy he had left behind. 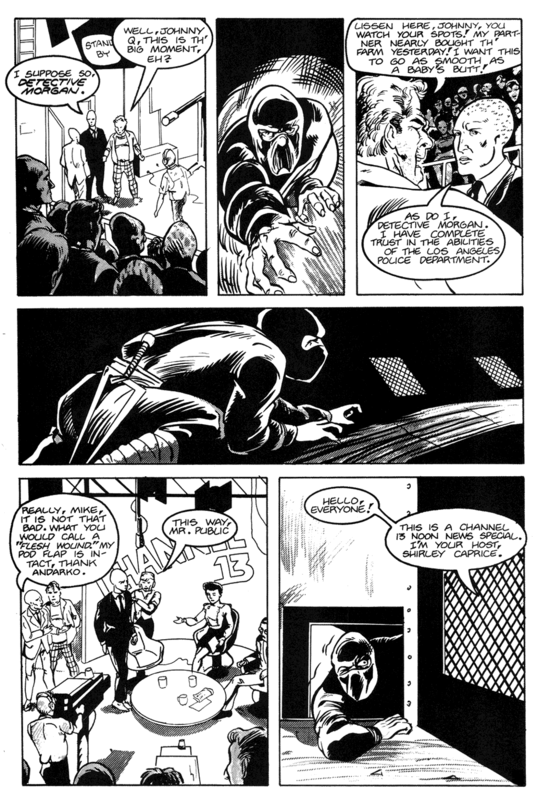 The title of the first issue of Shadowlock, Grey Legacy, became the title of our entire series. This insight led to an unprecedented (for us), burst of creativity as we expanded our ideas into this new concept. We did tons of sketches and filled pages with notes (most of which survive in a couple of 3-ring binders we jokingly refer to as the Grey Legacy Bible). But for all of this creativity, we knew we weren't ready to actually produce the book yet, and decided not to attempt to do so until we had improved our skills. One of the first issues we had to address was the mish-mash of styles that contributed to the amateurish look of Shadowlock. We couldn't both keep on doing everything. As I've said, from the beginning Fred has been a better artist than I am. Since his pencils are very detailed and precise and mine are a lot more sketchy we decided to let him do the pencilling stage of Grey Legacy (and the tedious job of hand-lettering... that's a skill I've never been able to master). It was at that point that I decided to hone my skills as an inker, and to do so I needed to settle on a tool. Tech pens always felt a little dead to me, and in my hands a quill pen is an ink-spattered blob of a mess waiting to happen. While I still believe that John's answer holds true (and some of my favorite inkers, John included, use different tools), I have always loved the effects that good inkers achieved with a brush, so I decided to make it my inking tool of choice. Talking about inking is a huge topic, and that's not what this whole blog is about. Like any skill it takes a lot of hours, a lot of practice, and a lot of ruined pages. But over time I learned it, and while I still believe that overall Fred is a better artist than I am, I'm pretty sure he would agree with me that I'm the better inker. While we were reworking Grey Legacy we didn't retreat from publishing entirely. While still in Edinboro Fred and I discovered the existence of The Plain Brown Wrapper, a music and humor 'zine published in Erie, Pennsylvania. They were looking for comics to include and found a whole apartment full of us. Fred and I, as well as roommate Gordon Nelson and friend of the apartment David Matthews (not that David Matthews, as he's fond of pointing out), began to contribute short single-panel gags and one page stories. This kept expanding until we were doing three and four page stories with a variety of characters and ideas. Through The Plain Brown Wrapper we became aware of the vast underground network of self-published mini-comics and 'zines. This sort of thing had always existed in some format, from the Tijuana Bibles in the early part of the 20th Century (look them up, but beware! Most are definitely X-rated and NSFW). The underground comix scene of the 60's produced Robert Crumb and S.Clay Wilson and a host of others. But it seemed like there was an explosion of these in the late 80's. Easy access to printers and copiers was part of the reason. Anyone could go to their corner Kinko's store and get cheap reproductions of their work. I don't know if there is any provable direct connection between the collapse of the B&W comics and the rise of the mini or not, but it seems likely to me. 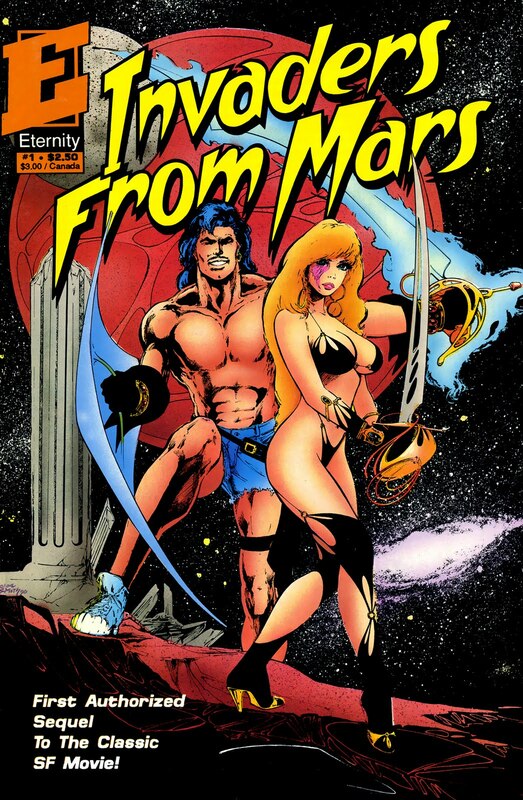 1986 proved that anyone could make comics whether they made money from them or not. There was a magazine called Factsheet Five where anyone could send their 'zines and mini-comics for a free listing and a review. We began to produce our own minis and to submit them. We would get orders for our books (usually people would just stick some money in an envelope to pay for the book and a stamp). Trading comics was a big part of the scene as well, so we ended up with stacks of poorly-drawn, poorly-written, cheaply-produced comics. It was wonderful. This was the Do-It-Yourself Punk Rock ethos being applied to comics. It was the Wild West... anything went. Very few people producing mini-comics had any delusion of ever working as a comics professional. They simply wanted to make comics, and in spite of what I've said above, some of them were actually pretty good. When the time came to publish Grey Legacy this seemed to be the logical first step. We had built a small audience, we didn't have the money to start a publishing business or print a traditional off-set press book, and comic shops and distributors, having learned their lesson in '87, were simply not interested in a small press black and white book from unknown creators. 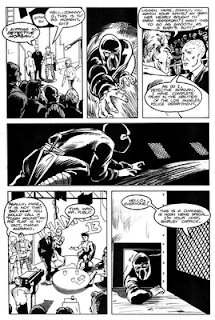 In spring of 1990 we published Grey Legacy #0. The zero numbering was a play on a trend that was happening comics at the time, but it was also a little bit of presumptuous arrogance on our part. We knew that the eventual plan was to publish actual comics, so we didn't want to confuse future readers with different #1's (are you listening Marvel and DC?). We published #'s 01, 02, and 03. Pretty quickly we were the darlings of the mini-comics world (at least the part of it we were involved with). We were featured in articles and interviews in the scene and sold quite a few copies (we spent a lot of time at Kinko's, this in the pre-computer graphics days of type-setting and manual paste-up). We received a fan letter from Denmark and to this day I couldn't tell you how someone there stumbled across a copy. Not to sound too arrogant, but Grey Legacy was simply a better quality comic than most of what was coming out of the scene. By this time we were working at the professional level we hadn't achieved in the Shadowlock days. We sent copies to a number of comics professionals whose work we admired, just to see if we could get some feedback. We received a number of very supportive letters and postcards back from Dave Sim (Cerebus), Scott McCloud (Zot! And Eventually Understanding Comics), Mike Allred (Madman) and Matt Wagner (Mage and Grendel). It was during this time that Wagner asked us to do the Grendel Tales proposal I mentioned a couple of blogs ago. As a result of all of this we were invited to participate in an actual comic book anthology series called Wavemakers. Editor Mark Innes had seen our minis and asked us to do a Grey Legacy story for him (and actually offered to pay us!). We jumped at the chance, of course. This was a book that was going to be distributed to comics shops, and our first stab at real publishing since '87. At first we weren't sure what to do. He had asked for Grey Legacy, and we certainly wanted to pimp our primary project. But, the first few issues were pretty tightly planned. We didn't want to do something from the main story that wouldn't appear in our book. The benefit of expanding our fictional world though was that we now had lots of secondary and tertiary characters to play with. We decided to tell a story set in that world, but not about our main cast. We settled on Brix. 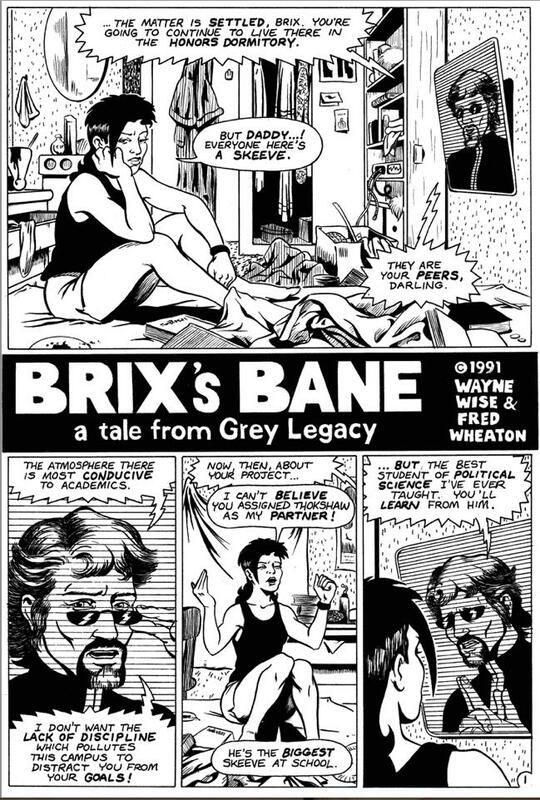 Brix was scheduled to appear in a Grey Legacy story (and if you look really closely you'll see her in the background of page 10, panel 4 of the first Grey Legacy story). She was meant to play a small, but very important role in the overall saga. That said, she was a character I was very fond of. Her role in the main story may have been small, but we were aware she had a life and other stories outside the main narrative. So we wrote and drew Brix's Bane, a nine-page story, sent it off to Mark Innes, and received a check. Wavemakers #2 came out in January, 1991. Also appearing in the issue were such small press comics luminaries as Evan Dorkin, Matt Howarth, Harvey Pekar and Wayno. This is the first page of the story. You can read the whole thing at Drunk Duck. This all took place right after I had walked away from my “career” in Psychology. Fred was working a crap job at a mall store and I started my career as a temp. He was doing some freelance art on the side, commissioned paintings and a few illustrations and book covers for a couple of local Pittsburgh companies. Through his contacts I sold some illustrations as well. Buoyed by the success of Brix's Bane I decided to start shopping my skills as an inker around to comics publishers. I did samples and sent them to most of the major publishing houses. DC is the only one that flat-out rejected me (though they did give me some very specific tips and critiques). Most of them, Marvel included, said they liked my work, but they simply didn't have any open assignments at the time and asked me to check again in a few months. This may have been utter crap, but it felt good to be told I was working at a professional level. I finally received a phone call from Tom Mason, editor at Malibu Graphics. At that time Malibu was in probably the top six publishers in the business and they were publishing a lot of books. He gave me my first professional inking assignment. 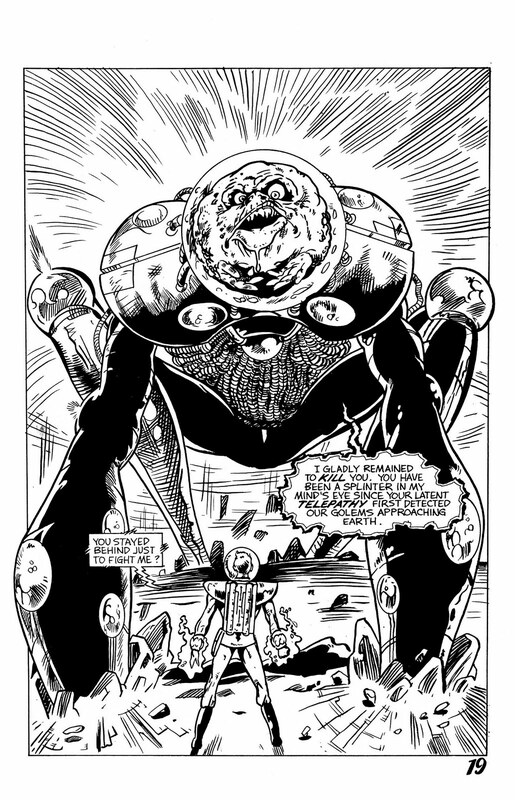 I inked a three issues mini-series called Invaders From Mars II. 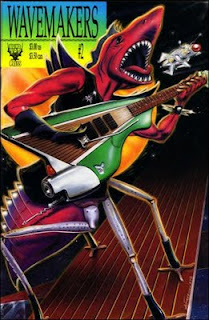 It was a comic book sequel to a 1980's remake of a 1950's scifi movie called, you guessed it, Invaders From Mars. 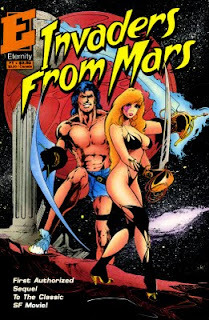 It was pencilled by someone named Sandy Carruthers and Written by Lowell Cunningham (creator of the comic book version of Men In Black that the film was loosely based on, also published by Malibu), with a pretty cool cover by Mike Grell.. I never met or spoke to either of them during this process (I met Lowell at a con years later). Sandy did the pencils and then they were sent to the letterer, then they were sent to me. I inked them and sent them back to the editor. The series appeared and I got paid. Not phenomenally well, but it was better than the temp work for three months. When that was over I received my second assignment for Malibu. 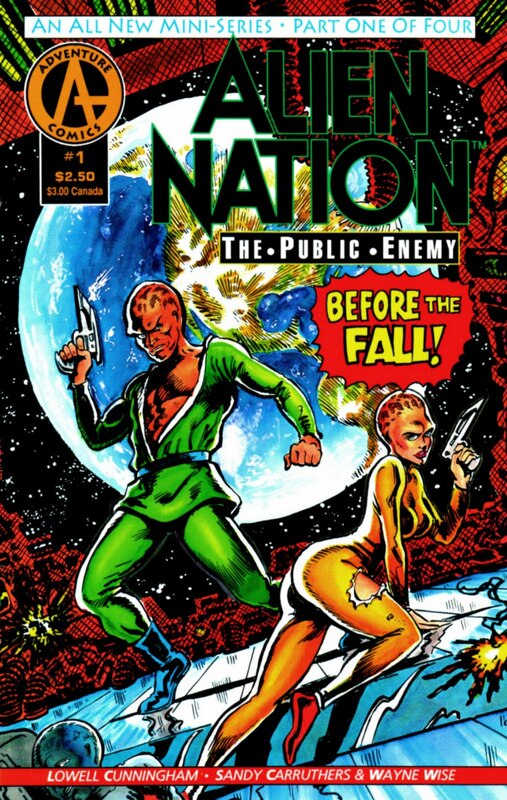 At the time they had licensed the rights to publish comics based on the movie and TV series Alien Nation. 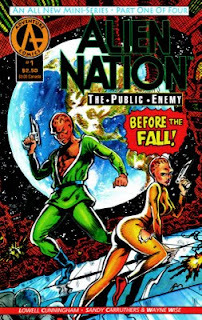 I inked a four-issue series (also by Cunningham and Carruthers) called Alien Nation: The Public Enemy. This was drawn on something called duotone board. There are two different shades of gray embedded in the paper that can be made visible using two different specific chemicals. In the hands of someone who knows what they are doing you can get some really great effects. I had never used it before in my life, and was given only two random pages to practice on before the first issue showed up in the mail. I think my lack of experience with this technique shows. But, like before, I got paid. Four more months I didn't have to rely on the temp work. That was my last work for a comics company, but certainly not my last comics work. Grey Legacy was about to move into a whole new realm. 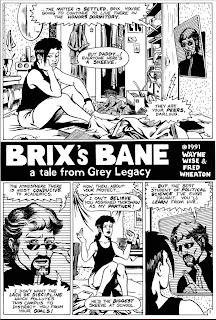 I can confirm that that is indeed Lori's robe in the first panel of Brix's Bane.